Unless the Lord builds a house of worship within me am I not laboring in vain? It’s not about performance, isn’t it about the condition of my heart? What is my heart toward Him, toward all He has made? Do I sit in judgement? Am I condemning who He has sacrificed for? Am I not the instrument and He the master? An instrument in the hands of a master is an awesome thing; every expression is at His finger tips. If he desires for the people to cry out with (name emotion/expression) He can do it! I am so limited by my skill and expression, however He is unlimited, no wonder my labor is in vain. 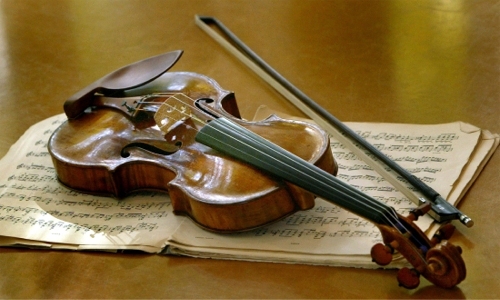 Consider: Why is a Stradivarius better than other violins? Is it not build quality, more specifically, is it not that all the parts are working in unison towards a common goal? Has God not created me such? 2Ps 139:13 NIV For you created my inmost being; you knit me together in my mother’s womb. My Prayer: Lord, let me keep my eyes fixed on you. Let me be an extension of Your heart. Let me be totally surrendered to you. Express Your love through me. Lord, fill my mouth with Your praises; play me like an instrument, let Your praises overflow from my heart because of the mighty things You have done for me. In Your great mercy You have saved me! All glory and honor are Yours!3Ps 139:14 NIV I praise you because I am fearfully and wonderfully made; your works are wonderful, I know that full well. Lord, I submit to You, my trust is in You. Tune me so that my heart overflows sweet music to You. Let the overflow of my heart bless my wife and children, drawing them closer to You; not because of who I am, but because of who You are Lord. Are You not a God of mercy?4Ps 40:11 AV Withhold not thou thy tender mercies from me, O LORD: let thy loving kindness and thy truth continually preserve me. 5Heb 4:16 AV Let us therefore come boldly unto the throne of grace, that we may obtain mercy, and find grace to help in time of need. Are you not the originator of grace?6Joh 1:14 NIV The Word became flesh and made his dwelling among us. We have seen his glory, the glory of the One and Only, who came from the Father, full of grace and truth. Are You not the author of love?71Jo 4:8 NIV Whoever does not love does not know God, because God is love. 81Jo 4:16 AV And we have known and believed the love that God hath to us. God is love; and he that dwelleth in love dwelleth in God, and God in him. What can You not accomplish?9Mt 19:26 NIV Jesus looked at them and said, “With man this is impossible, but with God all things are possible.” 10Mr 10:27 AV And Jesus looking upon them saith, With men it is impossible, but not with God: for with God all things are possible. My hope is in You! Amen.